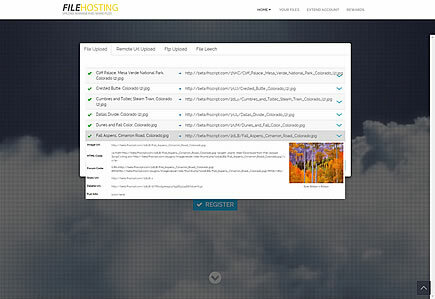 Our multi-file uploader is ajax based, written in HTML5 and is supported by all modern browsers. Unlike other file upload scripts, it has no reliance of Flash or Java applets so the user doesn't need any additional plugins installed within their browser. For supported browsers, it also uses 'chunked uploads'. This breaks apart the file before uploading in order to bypass any server limitations. Support for chunked uploads if supported by browser. Bypasses PHP limits and any tmp folder size restrictions. This is useful if you plan to allow larger file sizes. Drag & Drop support to begin uploading. Links to forum, stats, sharing etc, quickly available once the files have been uploaded. Copy all file links to the clipboard button. Set the maximum upload file size for free & paid users via the YetiShare admin area. Link to statistics for the file. Option to copy existing file into your account on the file details page (~i page). Can not be used for password protected files. You can see the multi-file uploader by going to our demo site.